Secondly, this urban development plays a part in “reducing” Nature and vegetation in the town. Cities are turning to green infrastructure systems such as green roofs to deal with rainwater at the source, and minimize sewer overflow risk and protect water quality. Technical solutions, referred to as “downstream options”, allow integrated management of rainwater, either by avoiding the creation of impermeable surfaces, or by compensating for its effects. However these solutions have numerous limitations: they are expensive to install and maintain, they often require additional land and do not provide a complete solution for controlling the rainwater entering the drainage networks. In 12 July 2010, the Grenelle II law set up a policy for managing water on plots, which was both ambitious and restrictive in terms of controlling waste. 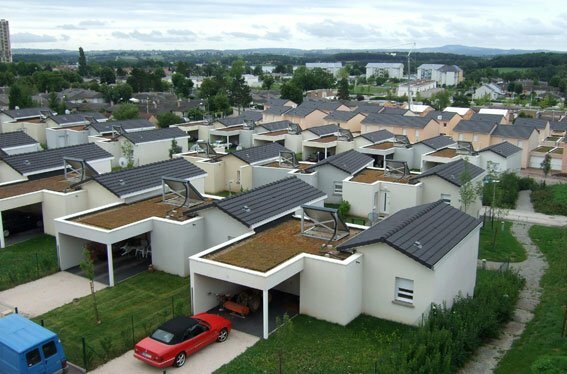 Traditional green roofs (solutions known as “upstream options” or “green infrastructure”) provide a partial response to these new constraints. Green roofs capture and hold some of the rainwater, slowing down the speed at which water drains off the roof into the drainage system. However traditional green roofs are not able to control waste draining from the roof (controlling flow rate). In order to manage rainwater on the plot at source (on the roof), more effort must be made to control and guarantee a consistent flow rate from the green roof, and to increase storage capacity. HydroVentiv® provides this additional control. Roof runoff coefficient: percentage of rainwater drained away by runoff from the roof. The rest is evaporated or retained by the system. Instantaneous flow rate from a roof: quantity of rainwater lost by the roof, expressed simply as the unit of time and surface (l/sec/ha). Produce monthly fluid reports on various vegetated roof complexes (water retention, run-off coefficient, waterproofing coefficient). Develop an innovative solution for controlling water on the roof.